Doberman Lab Mix - Perfect Pet Or Devoted Guardian? You are here: Home / Breeds / Doberman Lab Mix – Perfect Pet Or Devoted Guardian? Are you wondering if a Doberman Lab mix puppy is right for you? Welcome to our complete guide to the Labrador Doberman mix! The Doberman Lab mix is the result of a Doberman cross Labrador. This cross breed is also known as a Doberdor. If you’ve been thinking about getting a Lab mix, a Doberdor could be the perfect dog for you. In this article, we’ll review size, likely temperament, and potential health issues. We hope this might help you to decide whether this mixed breed is right for you. 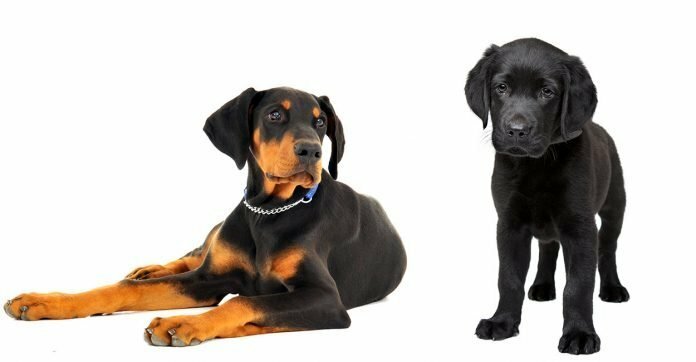 Why Choose a Doberman and Labrador Mix Puppy? This mix combines the best traits of the ever-popular Labrador, with the distinctive Doberman. Crossing two pedigree breeds to create a mixed breed or ‘designer dog’ has grown in popularity. However, some people don’t agree with this practice. Opinions are divided. Some dog owners are passionate about pedigrees. Others are equally enthusiastic about mixed breeds. It’s important for pedigree fans that their dog is registered on a closed list. Breeding from such a list allows a degree of predictability. This means puppies are likely to share similar characteristics to their parents. Owners of mixed breeds say the pedigree dogs of today were the designer dogs of the past. Men created pedigrees by crossing different breeds of dog. Pedigree registers have been closed for a long period of time. So, it’s important to be aware of the issues around owning a dog on a closed register list. Some research suggests “hybrid vigor” means mixed breeds are generally healthier than their pedigree counterparts. It is claimed that breeding pedigrees from a closed register narrows the gene pool of these breeds. As a result purebred dogs are prone to a variety of health issues. Opening the gene pool by creating mixed breeds helps to increase the health and vitality of those puppies. Make sure your mixed breed puppy is bred by a reputable breeder. By that we mean a breeder who carries out genetic health tests on the parents and provides a good level of care. Let’s move on to looking at the characteristics of the breed you’re here to find out about – the Doberman Labrador mix. Unlike some mixed breeds, we don’t know much about the origins of this particular hybrid. Before we take a look at the Doberdor in more detail, let’s look at the history of both the parent breeds. Despite their name, the Labrador retriever traces its heritage back to Newfoundland. The breed gained recognition from the American Kennel Club in 1917. The majority of breeding then moved to the UK, with the breed eventually dying out in Newfoundland. We can trace the origins of the Doberman Pinscher dog back to the 1890’s. German tax collector Louis Dobermann wanted a dog which could provide him with companionship and protection. Using a range of breeds including Greyhounds, Rottweilers, and Manchester Terriers, the Doberman was born. It was recognized by the American Kennel Club in 1908. Now we know a little bit more about the origins of both these breeds. Let’s take a closer look at what you could expect when breeding them together to get Doberman Lab puppies. It can be difficult to predict exactly what your Doberman x Labrador puppy will look like when it grows up. It could look like either of the parent breeds, or a mix. So, let’s look at the typical appearance of those breeds. You’re probably familiar with the Lab’s features. These include its stocky build, broad expressive face, and short, thick tail. After all, it is the most popular breed in the US. Dobermans are striking looking dogs. They have muscular bodies and a high head carriage. This makes them appear proud and alert. You might have seen photos of Dobermans with upright ears. However, don’t expect this if you pick a Doberman Labrador puppy. Dobermans with erect ears have had them surgically cropped to make them stand up. This controversial procedure was subject to a 2016 study. It found that this procedure can lead to a dog being perceived as “more aggressive, more dominant, less playful, and less attractive”. Additionally, many dog owners don’t agree with putting your pet through unnecessary cosmetic procedures. You can be fairly confident your puppy will end up somewhere within this range. Labradors are a medium-sized breed. Male Labradors are expected to weigh 65-80 pounds, and are 22.5-24.5 inches tall. Females are smaller, at 55-70 pounds and 21.5-23.5 inches tall. Dobermans are also medium-sized dogs, usually slightly larger than Labradors. Males typically weigh 75-100 pounds and stand between 26-28 inches. Females tend to weigh 60-90 pounds and stand at around 24-26 inches. Labrador retrievers have three accepted coat colors. These are yellow, black, and chocolate. Most of us are familiar with the classic black and rust colored Doberman. You may not know that this breed also includes red, blue, and fawn coats. All of these have rust markings on the face, chest, and legs. Your puppy could end up with any combination of these. So, you could get a Chocolate Lab Doberman mix puppy, or one with classic black and rust Doberman markings! Regarding coat type, Labradors have a double coat: a wiry top coat and a softer undercoat. This double coat maintains body temperature and repels water. Dobermans have a smooth, short coat. Due to this thin coat, they find it harder to keep warm in winter. So, both Labradors and Dobermans have short coats. As a result you can be confident that your Doberman Lab cross will end up with the same. Let’s take a look at what that means for your grooming regime. Dobermans’ sleek coats shed minimally. This means they only need a quick brush to keep their coats in tip-top condition. Whilst Labradors are also short-haired, they shed seasonally. This is due to their double coat. When they do shed, there’s a lot of hair! Your Doberman Lab mix puppy may end up with a double coat. If that’s the case, weekly grooming sessions will help keep their coat in great condition. A mixed breed puppy could end up with the temperament of either parent breed (or a mix of both!). It’s important therefore to be aware of the classic temperaments of both Labradors and Dobermans. Any owner will tell you about their Lab’s intelligence. It is a common trait of the breed. As is their cheerful disposition, and desire to please. A Lab’s enthusiasm may be overwhelming for some. Labradors often suffer from anxiety if left home alone all day. Anxiety in dogs can result in destructive behavior. Early examples of the Doberman were known to be sharp and more aggressive than many other breeds. Now though, careful and considerate breeding has prioritized a softer temperament. Your Doberman Pinscher Lab mix puppy could end up with the keen and easy going nature of a Lab. On the other hand it might have the sharper intellect of a Doberman, or something in between. Neither of these breeds cope well with being left home alone. As a result, you can be fairly certain your pup will share this trait. Labradors are typically easy to train and enjoy interacting with all members of their family. Dobermans are an alert breed, with a willingness to protect their master. This means they require careful training and socialization from an early age. Male Dobermans can become territorial. Consquently, keeping two male dobermans in the same household may not be a good idea. Both parent breeds have high energy levels so it’s likely that your puppy will need long daily walks. All puppies are cute, but Chocolate Lab Doberman mix puppies are on another level! Remember that many dog breeds are susceptible to particular diseases. Before you take on a mixed breed puppy, it’s important to familiarize yourself with typical health issues of the parent breeds. Labradors are susceptible to a range of genetic diseases. DNA testing is a reliable way to make sure puppies are bred from healthy parents. This can minimize the risk of inheriting these conditions. Hip and elbow dysplasia are inherited. These occur when these joints don’t develop correctly. Breeders will assess the joints of parent dogs, and you’ll want to see the scores. Progressive Retinal Atrophy (PRA) causes blindness. It affects Labradors, Dobermans, and has been shown to occur in mixed breeds. Eye exams and DNA tests will confirm whether parent dogs are affected, carriers, or PRA clear. Exercise Induced Collapse is inherited, but is also affected by temperature, type of exercise, and excitement levels. You can read more about Labrador health here. Dobermans are also affected by a number of health conditions. Hypothyroidism affects a dog’s metabolism. Dobermans have a significantly higher risk of developing this condition than some other breeds. Once diagnosed, owners can easily manage this condition with daily pills. Hip dysplasia and PRA can both also affect Dobermans. As a result, checking the scores of both parents is imperative. Von Willebrand’s Disease (vWd) is an inherited blood clotting disorder. Affected dogs can potentially suffer from excessive bleeding. Many Dobermans carry the gene for this disease. Fortunately, genetic tests are available to show whether a dog is clear, a carrier, or affected by vWd. Albinism in Dobermans is caused by a genetic mutation. Since 1996, the AKC has had a tracking system which identifies carriers of this gene. In the linked article, Davieds recommends that people do not breed dogs with this gene. Wobbler’s syndrome involves compression of the spinal cord, leading to paralysis. Treatment involves a range of non-surgical and surgical options. Dilated Cardiomyopathy (DCM) affects the heart walls, and can result in heart failure. It’s diagnosed using ultrasound or a blood test. Incidence increases with age. A 2010 study found that 44% of Dobermans aged eight or over were affected. Bloat can commonly affect deep-chested dogs like Dobermans. It involves the dog’s stomach filling with gas. This requires emergency treatment from your veterinarian. There are many potential health issues that affect Labradors and Dobermans. Therefore, it’s important to find a breeder with a good reputation for producing healthy puppies. Genetic testing combined with vet checks is the best way to ensure this. Hip dysplasia and PRA can affect both Labradors and Dobermans. Therefore, you’ll want to make sure each parent has good hip scores. They should also have a clear eye test, and a certificate showing they are PRA clear. For the Lab parent, you’ll also want to see good elbow scores. The Doberman parent should not suffer from hypothyroidism. A vet should have checked the parent for cardiomyopathy and vWd. It’s thought that hip dysplasia can equally affect pedigree and mixed breed dogs. Dilated cardiomyopathy, elbow dysplasia, and hypothyroidism are more likely in pedigree dogs. Both Dobermans and Labradors tend to live for around 10-12 years. This means that you can be fairly sure that the same will be true for your Doberman and Lab mix puppy. This mixed breed has yet to hit the popularity levels of some other crosses. Though, there are still reputable breeders producing lovely pups. 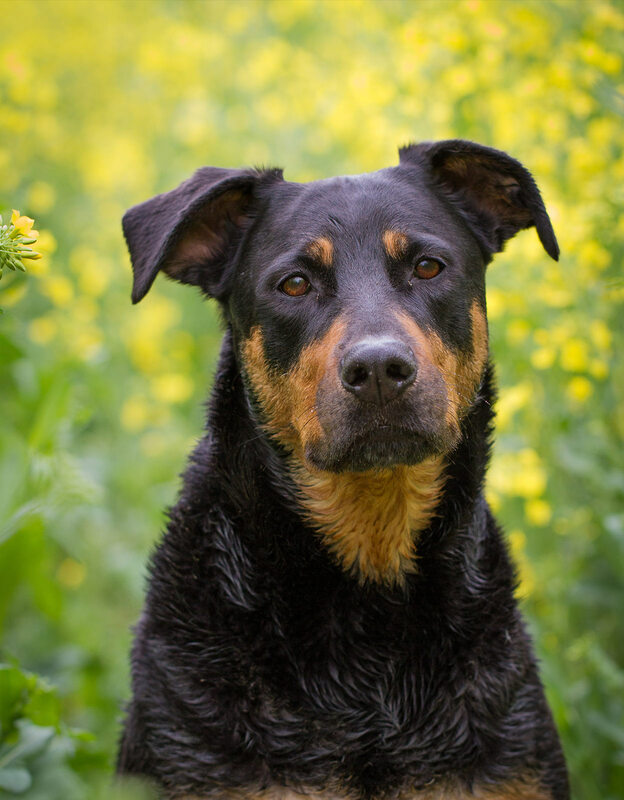 Health testing for issues which affect both parent breeds should definitely be a priority. Any breeder should be happy to talk through these tests with you in detail. They can show you any results and certificates for both parents. They should also allow you to spend time with both the litter of puppies and the parents. There’s no reason why you couldn’t consider adopting from a shelter. This is certainly true if you have experience with either of these breeds. Most importantly, you should be able to provide a safe and stable home. Bear in mind that the history of a rescue dog’s parents won’t be readily available, including results for genetic health conditions. A shelter will usually arrange genetic testing at your request. Any rescue center may carry out a full home check. You’ll likely need to pay an adoption fee in addition. Don’t rush to the first advert listing for Doberman Lab mix puppies that you see. Take an objective look at the home you can offer this mixed breed to make sure you’re a good match. These puppies will grow into medium dogs, with high levels of energy and intelligence. It’s likely that they will enjoy constant companionship from their owners. With the right training and exercise, they could be the perfect family dog.